A one year experiment seeks to discover whether coaching can help ordinary people achieve extraordinary things. Confronted, challenged and frequently overwhelmed, four participants will bet everything on their bold visions on the future. In one night of drinking, Rob lost everything. His Emmy award now sits on the shelf, a reminder of the career he once had, and the family who will no longer take his calls. Precious weighs 327 pounds, yet her dream is to create a lingerie company to inspire other curvy women to love their bodies. Soon Loo is a high flying executive who jets around the globe every month, yet behind the crisp suit he lacks fulfillment, and worries that his talents are being wasted. Chad is a 43 year old virgin who is still searching for love. Share in the experience as Rob, Precious, Soon and Chad are challenged to let go of the past and commit themselves to who they want to become. Working with an elite team of coaches and mentors, including Marshall Goldsmith, Jack Canfield, John Grey, Chérie Carter-Scott, Mark Thompson and many more, our four participants will try and transform their lives. The coaches will ask the searching questions, advise on business strategy, and walk their clients through every step of their transformation. But no one said it would be easy. 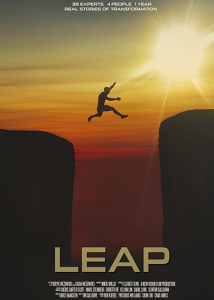 A moving story of courage and transformation which sets out to inspire one million people around the world to realize what is possible, and take their own Leap.